OK. So I guess the cat's finally out of the bag, as Google has finally disclosed the reason behind the massive search traffic drop that effected millions of websites last month. In response to the drop, we conducted a few case studies of our own, and looked over the traffic patterns for various websites, large and small. We concluded that there was definitely something wrong, and Google was making changes at the back-end without telling anybody (You can check the study out here). Well now, Google has finally disclosed the reasons behind the traffic drop in an event held Thursday that marked the company's 15th birthday. ...it's a major overhaul of the search engine! OK, the "not another beast" part might not be entirely true, because this new algorithm is called the Hummingbird (like the Panda and Penguin updates). But you gotta hand it to Google for taking something innocent, and turning it something nasty; and apparently, the more innocent, the nastier it is (Google's perverse logic, as it should be called :P). But forgive me for straying off-topic. 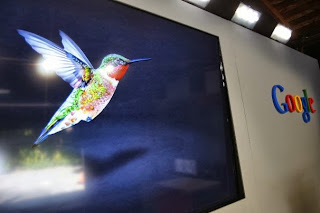 As I was saying, it's a major overhaul of the search engine codenamed 'Hummingbird', and it is the biggest change since the 'Caffeine' update in 2010 - possibly bigger, much bigger. "It is really big," admits Amit Singhal, a Google Search executive. Two major changes can be identified from Google's announcement. As Google has evolved, people have learned to search for phrases and sentences rather than simply words. This is a challenge, because it makes search queries complex. So Google has been working all this time to entertain more and more complex queries. Hence, longer and more complex search queries can be used now for searching content on Google. The purpose is to 'understand' what a searcher wants. So for example, if I want to compare the nutritional benefits of olive oil and coconut oil (something a Google executive showed off at the event), I won't just be given a list of websites with relevant content. Instead, I will see all the nutritional information in the form of a comparison right there on Google, which means I won't have to actually click through to any website for the desired information. A search algorithm like that is bound to hurt a website that writes about olive oil and its benefits! Google has now improved upon its voice-based search as well. People speak differently, and write differently. So voice-based queries are different, and more complex than text-based ones. People also use smartphones to search the internet, which also means more voice-based (and ultimately complex) search queries. Using this as a motivation, Google has designed the new algorithm to better understand voice-based queries, and return relevant results. It now also features support for varying dialects and accents, which is a plus-point for international users (outside the U.S). As a casual web surfer? It means Google is your go-to place for searching for stuff. Forget Bing or Yahoo. But the more avid user can immediately find a problem; Google is gaining more power. And we all know what happens when there's an imbalance of power, don't we? It makes people dependant. Kind of like putting all your eggs in the same basket. And I don't need to tell you how perilous that can be. For webmasters, it's cause for concern, because most of their traffic depends on organic search through Google. And if Google suddenly decides that it can provide the content you have on your site by itself, then there's nothing much you can do about it. But what surprises me is how biased is the attitude towards large, corporate websites. Small websites with great content usually get penalized, whereas the big fish in the corporate world mostly get away with. Not to take a deliberate or personal shot, but when you have free time on your hands, do take a look at the content produced on the site ehow.com, and then tell me if their search ranking is justified or not. Absolutely true.ehow.com or you can take about.com as an example,they doesn't provide detail and quality articles which can really help users but still they never get penalized.This is totally unfair. Funnily enough, but none of my sites got hit by this update. My oldest one got its usual seasonal influx (about 50% more visits in September when college starts), my two growing ones kept up with their modest but steady growth. Only Blogger-hints-and-tips has slowed down, and this is simply the continuation of a slow trend over the last three months. So I'm personally not convinced that it's made any difference at all. I'm happy you didn't experience any of the Traffic drop recently because if you did, you wont be happy at all.. Can you believe my Technology Blog that used to get a daily pageview of 3500 a day just dropped to 500 a day, I'm really affected and I've still not recovered. Thanks to Google, for delivering sweets like this on its 15th birthday. Ah! My Etsy shop has been hit too; which has been difficult since this is the start of the holiday shopping season. we're all eagerly waiting for that article from MBT. We are definitely waiting for some answers. So many businesses have been effected and it's just not fair. These businesses depend on sales to support their families. I hope Google hears and listens to the people! plz some one help me. Yes! Your adsense account has been disapproved, cos your blog is not as Google adsense policy! First create your own content or you don,t have permission to give Download link to your visitors! its totally against Adsense policy! I hope it will help you Sakandar Khan! Your adsense account has been disapproved because you are using torrent links. Yes! brother Muhammad Faheem Usama. you are right! publisher don,t have permission to run Google Adsense ads on those pages who have torrent download links or software download links! I hope they will understand Google Adsense policy! Well this explains why traffic at etsy is tanking... hey THANKS but NO thanks google. Google Enjoy its monopoly in the market. As a webmaster we did not denied the importance of google but we should stop using google product to hit his monopoly in market? The attitude of Bing staff is such that you know that they have already given before they could even pitch a fight against Google. Yahoo do not have something like Google Adsense for developing countries. Microsoft has to take the challenge with Yahoo else Google is an unannounced winner in the field. Go ahead Google,Produce your own content! You don't want you old content creators,right? How unfair! Isn't it illegal in some way-like having a huge monopoly?? I have definitely felt the hit or should I say lack thereof, on my shop on Etsy. It is trickling down in a bad way. Google is killing the small business owner. This is really hurting the small businesses such as myself. I was doing well with my Etsy shop and now my sales and views ahve dropped off. This needs to corrected so we can recover from this. Many people depend on their small businesses to make a living for their families. Not fair, please fix as soon as possible! Not every site affected. And the algorithm change that you listed here is very useful for users and we all work towards on customers only. So this change is the welcome one. Thanks for the info. Great read.